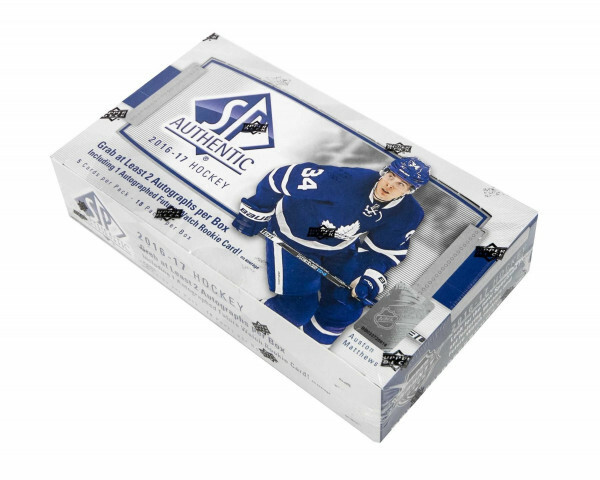 Factory Sealed 2016/17 Upper Deck SP Authentic Hockey Hobby Box mit 18 Packs Per Box, 5 Cards Per Pack. In jeder Box: 1 Hard Signed Rookie Future Watch Autogramm, 1 weitere Autogrammkarte, 1 Spectrum FX Card und 1 weiteres Autogramm oder Spectrum Card. 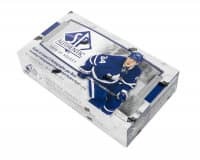 Produktinformationen "2016/17 Upper Deck SP Authentic Hockey Hobby Box NHL"
Look for the new Spectrum FX set featuring 100 stars and Future Watch rookies, printed on gorgeous spectrum Light FX! Find Sign of The Times multi-player autograph cards including 2's #'d to 25, 3's #'d to 15, 4's #'d to 10, 6's #'d to 6, & 8's #'d to 5! 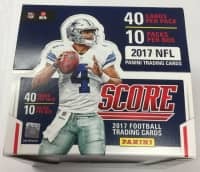 Find Upper Deck Updates and Young Guns Update cards Including Exclusive parallels #'d to 100 & the highly sought after High Gloss parallel #'d to a mere 10! Continue your collection of Global Chirography and Great White North Signature Cards. Weiterführende Links zu "2016/17 Upper Deck SP Authentic Hockey Hobby Box NHL"
Fanbewertungen für "2016/17 Upper Deck SP Authentic Hockey Hobby Box NHL"